The T-D2 series is well suited for residential/commercial applications such as small restaurants and beauty salons. Utilizing HRS35 copper alloy for the heat exchanger tubing, the T-D2 series is also suitable for heavier-residential usages such as space heating or domestic recirculation systems. Remote control included as a standard feature. The T-D2 supplies hot water to domestic hot water systems (directly or indirectly) which can be used with storage tanks, recirculation systems, hydronic heating systems, radiant floor systems, and/or domestic & heating applications. The 9007603005 Remote Temperature Controller (TM-RE30) allows the output temperature to be adjusted beyond the factory settings, and works as a diagnostic tool for error codes. 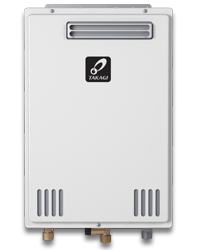 The Product Preservers® Anti-Scale System protects your tankless water heater from damage due to scale formation. This system does not add chemicals to the water or require electricity. As water flows through the filter, hard water minerals form inactive scale crystals which flow through the water heater without sticking to the heat exchanger. The system virtually maintenance free as the filter only needs to be changed every two years. Replacing the filter is easier, faster, and needs to be less frequently than using isolation valves to flush a water heater with a cleaning solution to remove scale buildup.